"Dear Self- Next time don't volunteer to cook all the food for your good friends, "I got my first our of college big boy engineering job and apartment housewarming." Self, guess you'll learn when you're slavin' over a hot stove makin' fried chicken, hot water cornbread, mac & cheese and sweet tea. These past two weeks since the new year has started I've been goin' through all my old post from when I first started bloggin'. It's always nice to look back and see where you've come from but then politely move on and say, "ohh I ain't goin' back there." Well, I found that little gem goin' through old post. Y'all I don't think i ever learned this lesson let alone applied it. I think I'll forever be barefoot in the kitchen cookin' somethin'. But anyways. I like to think that in The South we know how to party. Especially dinner parties. Every year we have a holiday party with the boys and Sherry. We usually try and have it around Christmas. This year everyone was so busy we ended up havin' it right after the new year. We'd been plannin' this party for weeks. No one could get it together. And they boys could have cared less. As long as Kolaches from West were involved they were good. All my Texas lovers understood that reference. One of the boys started goin' on and on about some 80 dollar goose and I was havin' none of that. Neither was Sherry. 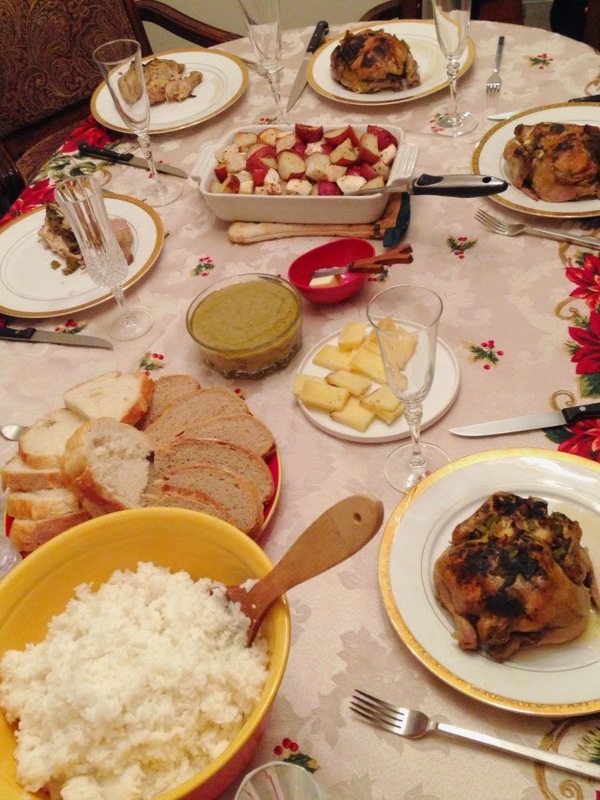 We came to the conclusion that I would make my Grandma's Cornish Hen recipe. All the boys would have to do was show up at Sherry's house. Makin' those boys do anythin' is hard enough so the only rule I had was for the love of The Good Lord no cargo pants. Y'all, I am pleased to say that not only did they all comply but a few even went a tad further and wore slacks and stayed off phones until the conversations reached a lull. Baby steps, y'all. Dinner was lovely as usual. I mean how could it not when i'm cookin'. And afterwards a lovely toast to cookies and the bestfrans engagement was made. I mean who doesn't love engagements and cookies. I know I do. Since My Granny's Hen's were so well received I thought I'd share the recipe with y'all. 2. Make sure your hens are well cleaned and thawed. 3. Stuff the chopped bell pepper, onion and celery inside the top and bottom of the hens. 4. Peel back a little skin on each hen and mush the garlic throughout. 5. Now, salt-pepper- and sage the hens. I premix my seasoning. I do about two tablespoons of each. 6. Take the remainin' vegetable and throw them in the roastin' pan. 7. Pour the melted butter everywhere. 8. Fill the pan about halfway with water. Cover and bake. 9. Make sure you check on your hens every so often and baste them. 10. I bake mine for about 3 hours. Here's to 2015 my frans: May your bellies never be empty and your heart full of love. It has been years since I've had cornish hens! Thanks for the recipe, I'll pin it for later. 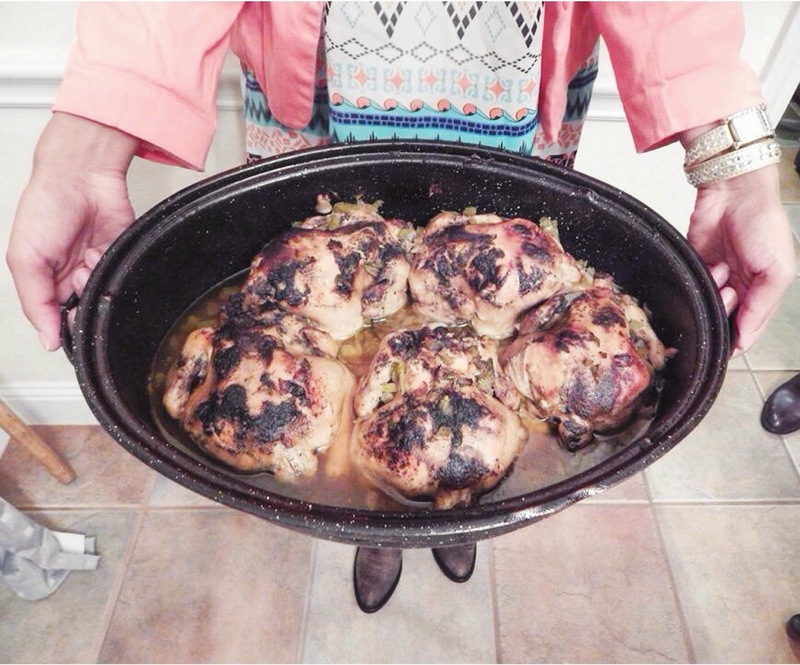 I've never made a cornish hen and you've made it look really easy! I only just made my first baby chicken.. sounds horrible.. 'baby' chicken. Bwahaha, not horrible at all. Raw meat takes gettin' used to but once you learn what seasonings go good on what meat and with what you are sold. I have never tried cornish hens I am so afraid of them! This makes me think twice about that fear. Looks wonderful. Oh girl!! Those cornish hens look DIVINE!! I bet they tasted super yummy as well!! I've never made Cornish Hens...they look so good! I've never made them but I am always up for trying new things and yours look amazing! This looks delicious! I have never had cornish hens before.